Memory can be a tricky thing. The reconstructive nature of memory can lead to many problems. These problems are discussed in the context of the conflict over recovered memories of sexual abuse. The DRM paradigm is introduced and used to explore false memories. The current experiment modifies the typical DRM experiment by introducing a condition where the prototype is shown. Subjects were able to distinguish between prototypes shown and not shown as well as any other word type, however, they were biased strongly towards reporting that a prototype was old. There are two different interpretations of these results that are discussed and possible avenues to clarify the issue are suggested. DRM Effect: False Memories or False Responses. Kinley, Jolene . Lethbridge Undergraduate Research Journal. Volume 1 Number 2. 2007. People like to believe that their memories are good accounts of what actually occurred in their past. However, memory has many flaws. Memories are not simply stored and retrieved. Information is encoded and memories are reconstructed using previous knowledge to piece together the situation as one thinks it occurred (Loftus & Ketcham, 1994). Memories are susceptible to much interference and can be lost, altered, and even created (Loftus & Hoffman, 1989). Every new piece of information gained influences our memories of the past. New knowledge can change what we think occurred and how we felt about it (Kunda, 1999). Each time we recall a memory it affects that memory and the availability of it. We may remember an event based on a previous recall rather than the memory itself (Read & Lindsay, 2000). We may also attribute qualities to the memory based on lack of recall or changing of cues, cause the forgot-it-all-along effect (Read & Lindsay, 2000; Arnold & Lindsay, 2000). Due to the malleability nature of memory it is extremely difficult, if not impossible, to determine which memories (or parts of memories) actually occurred unless there is another source of information. The understanding of the way memory works and the difficulties with taking memories as truly reflective of events has brought serious question to issues such as recovered memories of sexual abuse, the weight placed on eyewitness accounts (Loftus & Ketcham, 1994), and the existence of multiple personality disorder (Humphrey, 2002). Recovered memories of sexual abuse are particularly controversial and potentially damaging. It was a widely held belief that a huge number of women and men were abused as children but repressed those memories as a defence mechanism, causing problems in their current life. Loftus (1993) argues that this belief is based on clinical anecdotes and loose theory. Loftus (1997) found it was quite easy to create false memories with simple suggestion. The creation of new memories seems to be especially effective when using techniques such as the guided imagery that is often used in therapy to try to recover memories of sexual abuse (Loftus, 2003). These memories created in the lab are often so convincing that the participant cannot believe that the memories are not real once debriefed (Lindsay, Hagen, Read, Wade, & Garry, 2004). Garry, Manning, Loftus, and Sherman (1996) found that the simple act of imagining an event increases feeling that it could occur, or has occurred in the past. Plausibility has a huge effect on what memories can be created in a person. The only memories they will accept are ones that are plausible (Mazzoni, Loftus, & Kirsch, 2001). Mazzoni, Loftus, and Kirsch, (2001) manipulated the plausibility of the events by using fake articles, imagery, or simply suggestion. The therapy that recovers these memories of abuse is characterized by suggestion and imagery. Although it is very difficult to tell the implanted memories from real ones, there are some slight differences between the two types of memories that can be found when already knowing which memories are fake. Lindsay and colleges (2004) reported that when participants are asked to guess which memory is false; they can correctly identify the memory despite feeling that it truly happened. The perceptual measures also appear to be stable for false memories over periods of time while feelings and other details increase (Wade, Garry, Read, & Lindsay, 2002). There are a number of ways to study false memories to try to determine the nature of them and possible ways to distinguish them from genuine memories. One of the most common ways that false memories have been studied is through the Deese-Roediger-McDermott (DRM) effect. Subjects are given lists of words that are all associated with a prototype but the prototype itself is not presented. For example, if the prototype is sleep, the list would consist of the 15 words most highly associated with sleep, presented in order from the most highly associated (bed) to the least highly associated (drowsy). The Deese-Roediger-McDermott (DRM) effect refers to the high-confidence false recall or recognition of the prototypes. This false recall or recognition often exceeds that of other high associate distracters and even the correct recall or recognition of low-associate targets (Deese, 1959; Roediger & McDermott, 1995). Read (1996) used the same basic procedure but included questions of confidence in the memories, remember/know distinction, and any unusual characteristics about the words. Sleep was given significantly lower confidence ratings than words on the lists, was more often judged as known than remembered, and there was no unusual characteristics reported. Read (1996) also varied the encoding instructions between serial learning, elaborative, and maintenance rehearsal. Encoding affected recall of the prototype with the highest recall evoked from elaborative encoding, and serial learning evoking the least recall. This current experiment is based upon Read's (1996) look into the more subtle characteristics of the false memories of sleep. The basic procedure is taken from Roediger and McDermott (1995). The major difference in this experiment is that in half of the lists the prototype is shown. This condition allows for signal detection analysis of discrimination for the prototype compared to other word types. This comparison in the past has been substituted for comparison of the prototype to the high associate distracters. The comparison of a prototype to a high distracter is fundamentally flawed, as they are qualitatively quite different word types. The prototype is highly related to ever word in the list by definition and the high associate may or may not be related to the other words. Another adjustment in this experiment is the use of both recollection and familiarity judgements in place of a remember/know judgement as suggested by Higham and Vokey (2004), as they are two qualitatively distinct processes. A total of 20 students from introduction to psychology classes participated in exchange for class credit. They were each tested individually at computer stations. Stimuli for the experiment were taken from the Appendix from Roediger and McDermott (1995). The first twenty word lists were used. Each list consisted of the prototype followed by fifteen associates of the prototype in order from most highly associated to the least associated. For example, sleep: bed, rest, awake, tired, dream, wake, snooze, blanket, doze, slumber, snore, nap, peace, yawn, drowsy. For each list thirteen words were presented in the study phase for a total of 260 words shown in the study phase. A total of one hundred words were presented during the test phase with five from each list. The study phase began for the participants with a message on the computer screen instructing them to read each word silently and try to remember as many words as possible as they would be tested on the words in the next phase. When sure the instructions were understood the experimenter clicked in the corner of the screen to begin the presentation of word. Each list was presented one word at a time in lower case in the centre of the screen for three seconds. The word next was shown between lists in upper case letters for 5 seconds. Each list was presented in one of four conditions. For two conditions the prototype was shown with the lowest associate not shown. The other two conditions were the reverse with the prototype was not shown and the lowest associate shown. For one of the conditions with the prototype shown the second and fourteenth word in the list were shown. In the other condition the third and fifteenth word in the lists were shown. The second and third word in the list were used as the high associates shown and not shown, and the fourteenth and fifteenth words were used as the low associates shown and not shown. Each list that was shown contained thirteen words. When all the lists in the study phase had been presented the next instruction page came up. The next instructions explained that words were going to be shown and that there were five judgements to make for each word. These instructions were reinforced by examples given by the experimenter about the judgements that would be asked. These instructions were followed by a simple test to clarify that they fully understood the distinction between familiarity and recollection. This test was four examples of different ratings for familiarity and recollection that was meant to further emphasis that the two could be completely independent of each other. The test was taken from Higham and Vokey (2004). The five judgements the participants were asked to make for each word were whether the word was old (shown in the test phase) or new (not shown in the test phase), a recognition judgement, a familiarity judgement, where in the list the word had been presented (or if the word was not presented where in the list it would have been), and how salient the word was. Each judgement was made using a slider to move between one and twelve. For the test phase five words from each list were presented: the prototype, the high associates shown and not shown, and the low associates shown and not shown. Between each word being tested, the word next appeared in the centre of the screen in uppercase letters for five seconds. Prototypes, high-associates, and low-associates were all significantly recognised, prototypes with highest recognition rates, followed by high targets, low targets, high distracters, and low distracters (see Figure 1). This pattern was the same for recall, recognition, and familiarity judgements. Prototype being shown during the study phase affected only the recognition of the prototype. False alarms to the prototype exceeded that of both high and low associates, replicating the DRM effect. 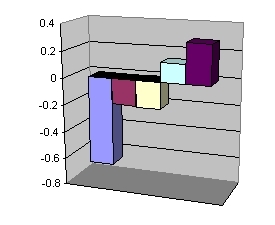 For each judgement except serial position word type had a significant effect, as computed by one-way within subject ANOVA's (See Figure 2). 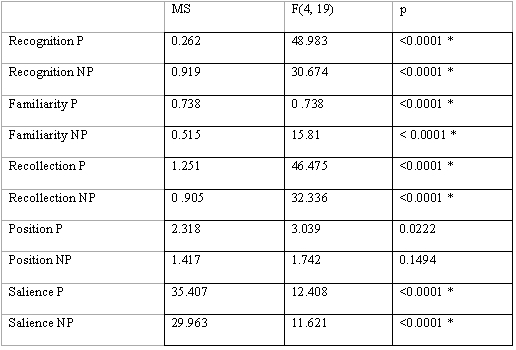 Signal detection analysis found no significant different in discrimination for any word type as calculated by A` (Proto= 0.699, HiProto= 0.786, HiNoProto= 0.797, LoProto= 0.752, LoNoProto= 0.747). There was, however, a large difference in bias found with B`. Participants were extremely liberal with their responses to the prototypes (-0.657), compared to all other word types. 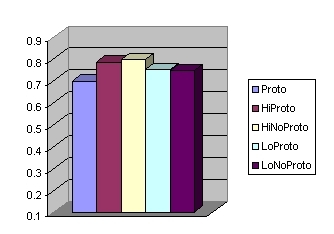 Differences in bias were not significant between the other word types but there was a general pattern of becoming less liberal as the words were less associated with the prototype, with participants actually being bias against reporting the low associates as being recalled (HiProto= -0.19, HiNoProto= -0.201, LoProto= 0.139, LoNoProto= 0.29). The results of the signal detection analysis can be better appreciated visually as seen in Figure 3 and 4. Although old vs. new prototypes are discriminated about as well as both high and low associates in the DRM recognition, they differ from either associate in the high level of “yes” responses they attract. Signal detection theory has two different ways to explain these results. The first is that the recall of sleep is a response bias. A response bias would indicate that participants are simply more willing to report sleep as old due to a criterion shift. The other possibility is that the criterion remains constant but the distributions actually shift. A distribution shift would imply that the high recall of sleep is due to a genuine memory effect rather than a response bias. Both explanations account for the equal discrimination but difference in bias that was found. The explanation that is correct could have many implications for our understanding of how memory works. The work done with the DRM paradigm has lead to many theories of how memory works. One of the most simplistic and oldest theories is the implicit associative response concept proposed by Underwood (1965). This model is based on the idea that when one word such as hot is presented the word cold is implicitly thought of because of their association. So the more words that imply sleep, the more likely that one will have thought of the word sleep and the more likely to judge it as being old. Another theory that is quite straightforward is the fuzzy-trace theory. This theory explains the DRM paradigm by saying that the independent traces of words related to sleep increase the likelihood of the category sleep being old (Roediger and McDermott, 1995). This is very similar to the gist theory that suggests that it is the general idea of the memories that is maintained and the specific details are lost (Barclay, 1987). Collins and Loftus (1975) suggested the associative network model of memory, also called the parallel-distributed process (PCP) model (McClelland, 1995). The PCP or associative network model is based on the idea that there are numerous interconnecting units that are activated when encoding a memory. When retrieving the memory the units are once again activated, bringing to mind other words connecting to the memory being retrieved. This model would explain the DRM effect as the activation of various words that are connected to sleep, thereby bringing sleep to mind. The idea that sleep is brought to mind and attributed to being on the list, rather than just a though is described as a source attribution error (Garry et al., 1996; Loftus & Hoffman, 1989; Roediger & McDermott, 1995). The most current theory and the one that seems to explain the results from the largest number of studies is that of discrepancy-attribution (Higham & Vokey, 2000; Whittlesea, 2004; Whittlesea & Williams, 2005). Whittlesea and Williams (2005) suggest a causal chain for the false recognition of sleep: 1) expectancy 2) uncertainty 3) affirmation or surprise 4) failure to attribute surprise to an internal source 5) attribution to past. This process involves production of precepts and then evaluation of that production process (Whittlesea, 2004). This process is captured by the SCAPE (Selective Construction and Preservation of Experience) framework that is very effective at explaining results, but unable to predict them. Whittlesea (1997) describes SCAPE that emphasises the interactions between memory and the environment to construct a model of the event in our minds built on all different types of information we have access to. If the DRM effect were the result of a response bias many models of memory would have to be adjusted to be congruent with this knowledge. However, some models are quite compatible with a response bias, such as the parallel-distributed process model. But if the increased false alarms to sleep were due to a genuine memory various models could still be used to explain the effect. More research is needed to determine which explanation is responsible for creating these ‘false memories'. Due to the significant difference in familiarity, recollection, and saliency judgements for sleep it would appear that there really is something fundamentally different about the prototype and participants appear to have real memories for the word. These judgements, however, could be attributed to the same response bias as recognition. As we are aware, judgements are subjective and not always an accurate description of what is occurring. Future research could extend this design to different stimuli known to induce false memories and it would be extremely beneficial to find less subjective methods of learning about the memories of, or responses to sleep. Only when we are not forced to rely on participants subjective experiences can we truly answer the question of whether the DRM effect is a false memory or a false response. A special thanks to Dr. John Vokey for everything you have done for me, I appreciate it more than I could say. Arnold, M.M., & Lindsay, D.S. (2002) Remembrance of remembered past. Memory, 0, 1-17. Barclay, C.R. (1987). Truth and accuracy in autobiographical memory. In M.M. Gruneberg, P.E. Morris, & R.N. Sykes (Eds.) Practical aspects of memory: Current research and issues, Vol. 1. Memory in everyday life. (pp. 159-188). Chinchester, Great Britain: John Wiley & Sons. Deese, J. (1959). On the prediction of occurrence of particulate verbal intrusions in immediate recall. Journal of Experimental Psychology, 58, 17-22. Garry, M., Manning, C.G., Loftus, E.F., & Sherman, S.J. (1996). Imagination inflation: Imagining a childhood event inflates confidence that it occurred. Psychonomic Bulletin & Review, 3, 208-214. Higham, P.A., & Vokey, J.R. (2000). Judgement heuristics and recognition memory: Prime identification and target processing fluency. Memory & Cognition, 28, 574-584. Higham, P.A., & Vokey, J.R. (2004). Illusory recollection and dual-process models of recognition memory. The Quarterly Journal of Experimental Psychology, 57A, 714-744. Humphrey, N. (2002). Frontiers of psychology and evolution: The mind made flesh. New York: Oxford University Press. Kunda, Z. (1999). Social cognition: Making sense of people. Cambridge, MA: MIT Press. Lindsay, D.S., Hagen, L., Read, J.D., Wade, K.A., & Garry, M. (2004). True photographs and false memories. Psychological Science, 15, 149-154. Loftus, E.F. (1997). Creating false memories. Scientific America, 277, 70-75. Loftus, E.F. (2003). Make-believe memories. American Psychologist, 58, 864-873. Loftus, E.F., & Hoffman, H.G. (1989). Misinformation and memory: The creation of new memories. Journal of Experimental Psychology: General, 118, 100-104. Loftus, E., & Ketcham, K. (1994). False memories and allegations of sexual abuse: The myth of repressed memory. New York: St. Martin's Press. McClelland, J. L. (1995). Constructive memory and memory distortions: A parallel-distributed processing approach. In D. L. Schacter, J. T. Coyle, G. D. Fischbach, M. M. Mesulam, & L. E. Sullivan (Eds. ), Memory distortion. Cambridge, MA: Harvard University Press. Read, J.D. (1996). From a passing thought to a false memory in 2 minutes: Confusing real and illusory events. Psychomonic Bulletin & Review, 3, 105-111. Read, J.D., & Lindsay, D.S. (2000). “Amnesia” for summer camps and high school graduation: Memory work increases reports of prior periods of remembering less. Journal of Traumatic Stress, 13, 129-147. Roediger, H.L., & McDermott, K. (1995). Creating false memories: Remembering words not presented in lists. Journal of Experimental Psychology: Learning, Memory, & Cognition, 21, 803-814. Wade, K.A., Garry, M., Read, J.D., & Lindsay, D.S. (2002). A picture is worth a thousand lies: Using false photographs to create false childhood memories. Psychonomic Bulletin & Review, 9, 597-603. Whittlesea, B. W. A. (1997). Production, evaluation and preservation of experiences: Constructive processing in remembering and performance tasks. In D. L. Medin (Ed. ), The psychology of learning and motivation, Vol. 37 (pp. 211–264). New York: Academic Press. Whittlesea, B.W.A. (2004). The perception of integraltiy: Remembering through the validation of expectation. Journal of Experimental Psychology: Learning, Memory, & Cognition, 30, 891-908. Whittlesea, B.W.A., Masson, M.E.J., & Hughes, A.D. (2005). False memory following rapidly presented lists: The element of surprise. Psychological Research, 69, 420-430.